This article gives a mountain of evidence that things are getting exponentially better for the richest and much worse for the working class. 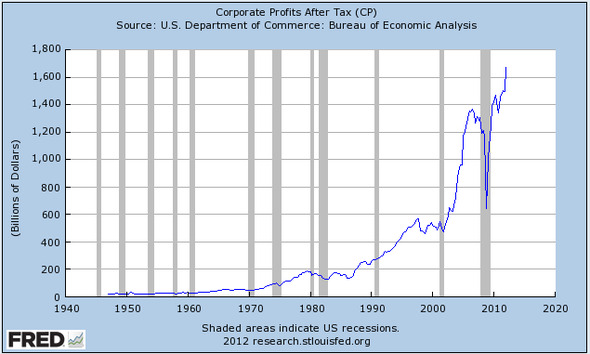 Just take one look at the chart showing corporate profits. Even using government statistics which are arguably massaged to be more optimistic than reality, the facts are stunning. yep, and if we complain, the rich people cry "socialist"! did you read the REST of it? no clue what you think is weird. Corporate profits should be a good thing. Higher profits = more taxes, except it doesn't for big corporations. Apple pays less than 10% in effective taxes, Google little more than that. The average corporate tax rate is 17-18%. Not being big enough to hide my corporate profits in overseas tax havens, I pay 35% plus another nearly 10% in California taxes. Small business are the engines of job and economic growth in America, but we're getting bent over with taxes to pull the over all average up to 17-18% subsidizing taxes for Apple, Google, GE, etc. If your federal effective tax rate is really 35% (which I doubt, it is probably your top marginal rate), then you are doing something wrong, like not taking advantage of retirement plan and health care premium deductions. I also run a small, albeit somewhat globally competitive, business, my business income is a tiny fraction of the two presidential candidates' and CEOs in general, and my effective tax rate, including social security (a few times I proudly paid the maximum) is about the same as (or even less than) theirs, and which is about the same as the government tax revenue/GDP ratio 17%-18%, one of the lowest, if not the lowest, in the advanced industrialized world, and I thank my lucky stars, except for the complexity which gives me a headache and puts me at legal risk even as I endeavor to do the right thing. To alleviate the headache somewhat, I live in a no-state-income-tax state, for which I also thank my lucky stars that there are a few of them in the US (and I believe that a lot of by now ex-Californians have done the same, fleeing to states like Texas). Back to the point of the thread, the fact is that, with the global spread of industrialization, the average US worker (EU/eurozone worker as well) is now competiting with the global average worker pool, and no longer just among themselves. Do the math. Unsustainable? Maybe: see sovereign debt crisis in Europe, huge budget deficits and now national debt/GDP ratio in US. My main criticism of globalization is the almost literal break-neck speed with which it was implemented in the 1990s-2000s, breaking the neck, so to speak, of the average worker in the countries of early industrialization, but masked by money illusion, which history shows works most of the time since ancient times, in this case in the form of cheap credit in the US (mixed with creeping socialism), socialism in Europe (mixed with creeping cheap credit). The question is do we put up barriers, on the one hand, or, on the other hand, accept the fact that a relatively small portion will maintain global competitiveness and keep pace while a relatively large portion will not and instead experience an at least relative decline in their standard of living, more or less leveling them with the average worker in countries like Brazil and China, etc.? In my view, the only barrier that should be rigorously enforced is on illegal immigration, the laxness of which has been a gross injustice to hardworking citizens. As well as cheap credit, which has impaired the value of the currency, saving, and investment decisions. Last edited by bale002; 06-15-2012 at 03:23 AM..
Look at the date ranges. "The few who understand the system, will either be so interested in its profits, or so dependent on its favors that there will be no opposition from that class, while on the other hand, the great body of people, mentally incapable of comprehending the tremendous advantages...will bear its burden without complaint, and perhaps without suspecting that the system is inimical to their best interests." "Owners of capital will stimulate the working class to buy more and more of expensive goods, houses and technology, pushing them to take more and more expensive credits, until their debt becomes unbearable. The unpaid debt will lead to bankruptcy of banks, which will have to be nationalized)"
In other words, there is nothng new under the sun. I thought I did look at them correctly. I'm not taking this entire graph, I'm splicing out the section from 1990 to 2005 which looks like from approx 250 billion to at least 900 billion in that timeframe. 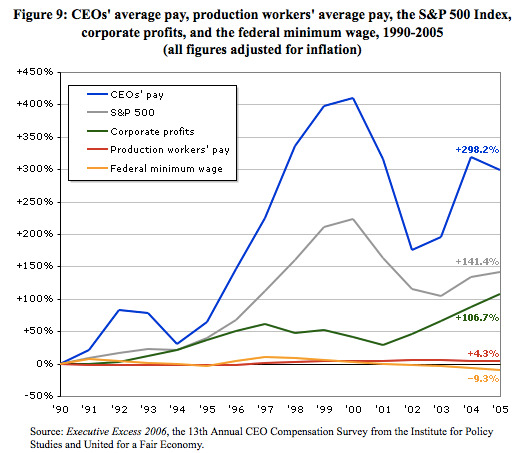 Then the other graph says from 1990 to 2005 corporate profits went up 107%, which is far less of an increase. What am I missing?